Your first Stroller Strides or Stroller Barre class is always FREE! This allows you to see first hand if Stroller Strides/Stroller Barre is a good fit for you and your little one! If you sign up here, our staff will send you an email to schedule your first free class. Your first FREE class is automatically gifted to your account and you can come try us out! Unlike prenatal yoga and Pilates, we incorporate a cardio component as well as use resistance, strength and body weight training to help prepare you for delivery. WHAT IF I HAVE NOT RUN SINCE BEFORE I HAD MY BABY, OR IF I HAVE NEVER RUN AT ALL? When & Where will 360 classes be held? Weekday daytime details coming soon! Weekday evening details coming soon! Will the class be held indoors or outdoors? During the months of May-October, class will be held outdoors (weather permitting). What is the intensity level of a 360 class? 360 is a moderately intense class. It’s fast paced - both in the exercises you’ll be doing and the speed of the class overall. It’s cardio focused and will get your heart rate pumping! However, there is some flexibility in the speed at which you complete the drills and run or jog. It can be as hard as you need it to be on your good days or scaled back on days you’re not sure how you made it out the door! Are there low impact modifications available during class if I cannot currently do high impact? By its nature, 360 is a high impact course. It involves a high level of cardio and activities such as agility ladders and low hurdles. You will be running, jumping, and shuffling through drills to increase your speed, agility and quickness. If you have health concerns regarding high impact exercises, please reach out to us to answer any specific questions. How is 360 different than Stroller Strides & Stroller Barre? 360 is a mom-focused, endurance based workout, while Stroller Strides/Barre is a full body workout. Stroller Strides/Barre provides lots of entertainment for the kids, such as singing, bubbles, etc. Kids are always welcome at 360 and moms will have opportunities to interact with the kids, but 360 is focused on mom getting a great, high-cardio workout. How is 360 different than BOOST? 360 is different than Body Back BOOST. 360 is an endurance based workout while our Body Back BOOST class is a HIIT (high intensity interval) workout. Both classes include cardio and bodyweight exercises, however, Body Back BOOST combines cardio with a full body strength workout in one hour while 360 is focused on cardiovascular endurance along with improving your speed, agility and quickness. What do kids do during 360? If you choose to bring stroller age kids with you, they will remain in their stroller for the entire class. Strollers will be parked and you will be near your kids, but you will not be entertaining the kids during class. When classes are held outdoors, you must take kids with you for short runs during the class. Can I come without my kids? Yes! 360 promises to be a heart pumping workout without the need of a stroller. Do I have to bring a stroller? No! 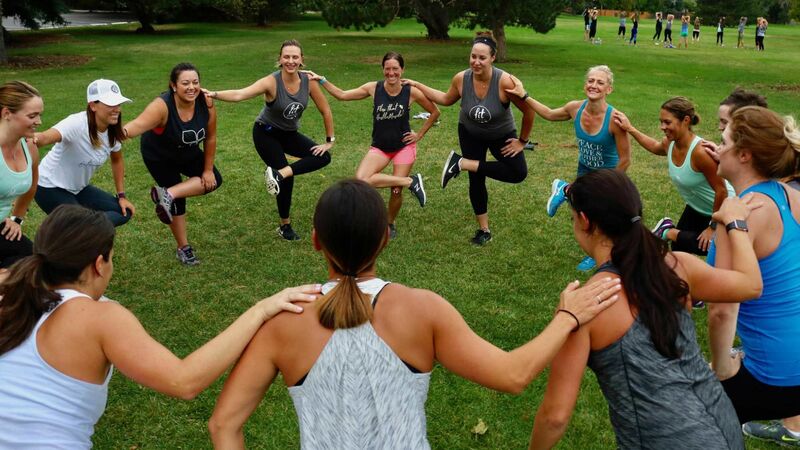 360 is a mom-focused workout that does not utilize a stroller. Stroller age children are welcome to come to class, but there will be very little interaction with kids (no singing/entertainment) and all kids must stay securely strapped in strollers during class. Can I take this class when I am pregnant? Can I babywear in this class? No. Babywearing is not safe in this class due to the speed and agility drills. How soon after having a baby can I attend 360? You can join this class when you have been cleared to exercise by your physician, usually between 6-8 weeks postpartum depending on your personal delivery and recovery. Yes! Partner/Spouses must pay the drop-in rate of $5/class. Please create an account on Pike13 for your partner, enter credit card information and sign the waiver. Can I use a membership or a pass? Yes, monthly memberships and class passes can both be used for 360. Is there a late cancel policy for 360? There is not a late cancel policy for our daytime classes. For weekend and evening classes, we charge a $10 late cancel fee for no shows or cancels within 2 hours of the class start time. When & where will Body Ignite be offered? We are currently offering 2 classes per week of Body Ignite in Wheaton at Moore Toys on Saturdays from 7-8am and 8-9am. More classes and locations are coming soon! Body Ignite is an indoors only class due to equipment. Is there cardio included in Body Ignite? No, Body Ignite is a low impact workout. How is this class different that a Body Back class? This class has no cardio. Body Ignite is also a 100% low impact workout. Body Back and BOOST classes can be modified to be low impact, however, this workout is completely naturally low impact from start to finish. Can I attend Body Ignite if I am pregnant or newly postpartum? Yes, you can do Body Ignite in any stage of motherhood - no restrictions! No. This is a womens only workout. Is there a limit on the number of women that can attend each class? Yes, we have equipment for a max of 10 women per class. Is there a late cancel policy? Yes - $10 fee will be charged for no shows or cancels within 2 hours of the class start time. QUARTERLY Fun Family Events - an opportunity to get the whole family involved in the FIT4MOM fun! Dads need friends too! Visitors are welcome to come to class FREE* of charge! If you have an extended stay guest who will participate longer than one week, they will be subject to a $10 per class charge. All visitors must sign our waiver in order to participate. You can return from your hold on any day of the month. You need to email cs.dupageco@fit4mom.com prior to your return OR just show up to class. Any staff member can remove your hold to get you back into classes. If you ever have any questions on your membership, you can email cs.dupageco@fit4mom.com or call us at 331-642-0055.